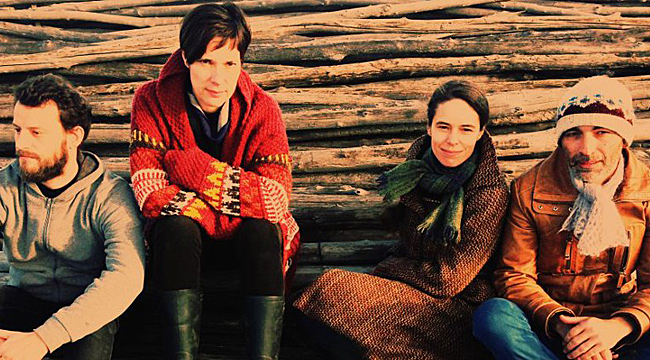 Best known as a member of Stereolab, the British electronic/pop band that had a good run throughout the ‘90s and ‘00s before going on hiatus in 2009, singer-multi-instrumentalist Lætitia Sadier has applied that band’s experimental tendencies to her solo career. For her latest solo effort, Find Me Finding You, she’s rechristened herself as Lætitia Sadier Source Ensemble, a name that more accurately reflects the collaborative approach she took on the album. Percolating synthesizers and hushed vocals give the album opener “Undying Love for Humanity” a real hypnotic feel, and the spoken word vocals of “Committed” sound eerie and evocative, suggesting Sadier still knows how to create a somber mood with her music. She phoned us as she drove to a tour stop in Phoenix. What were your first impressions of [Stereolab’s] Tim Gane when you met him? I thought he was wonderful. We had a deep love for music in common. He came from a different background than I did. He was a much more experimental background with the likes of Throbbing Gristle. I didn’t have that. But there was a big overlap still because he had a great appreciation for melody and loved music. We both liked Joy Division and the Residents. I brought the French pop thing from the ’60s and ’70s and Brazilian music. We just fed each other. He had a great knowledge of music and a much bigger record collection. You collaborated with slew of artists in the 1990s and 2000s. Talk about what some of those experiences. I love working with others. It’s great if you’re with the right people. I guess we always had these outlets. Even in Stereolab, it was very hybrid-ic. We would take different genres and fill them in together. In the same way, working with people and collaborating with people happens quite naturally. I still have a collaborative approach with my own recording. It’s about achieving things through others. Every situation that is took thousands of people and thousands of actions. Everything has to happen through cooperation and collaboration. It has a value. Talk about making your first solo album, 2010’s The Trip. It was a very different experience because it was me who was driving people. With Stereolab, Tim kept tight control over everything. It was difficult to get anything in. I had ideas and fresh music that I wanted to work on. I had done three albums with [the indie band] Monade, and it was like a playground. You develop your own ideas and start experimenting with them and start expressing them. That was very formative as well. After those three albums with Monade, my boyfriend at the time encouraged me to go under my own name and at the same time Stereolab disbanded. It happened very naturally. There was no master plan. Things kind of shifted. After those albums, I had more confidence. How did Source Ensemble come together? I performed with a trio under my name for five years now. They’re two friends, [drummer Emmanuel [Mario] and [bassist] Xavi [Muñoz]. This year, we took a new member on, Phil F MU, who sings with us. That makes four of us now and we realized we needed to call us something. One morning, the name came up and we became the Source Ensemble, which I feel more comfortable with. I do perform solo as well and perform under my own name. When did the songs for Find Me Finding You start to come together? It’s a long process of writing. I never analyze it too much. Things come to you naturally when you need them—as if by magic. I’ve learned to trust that process. Again, it’s about relinquishing control. It’s ten times more interesting than if you’re trying to control and force everything. I collect ideas as I go along. When it’s time to write an album, I go to my bag of ideas and then start developing them. “Committed” has such an eerie feel to it. What’s it about? It’s about the idea of organizing society in a different way. I view society as a body. Just like a body, it has layers of functioning. A body has nerves and hormones and emotions. Science has never gone too deeply into those systems and how they relate to each other and yet they have a strong impact. It’s not like a machine with mechanical parts. It’s more than that. It has ways of functioning that are very special. Look at Brexit. After it passed, the Pound was worth 15 percent less and businesses were leaving. It hasn’t even happened yet. There’s a reaction. This is a song about organizing ourselves with this in mind and thinking of the duration and thinking about spirit rather than just numbers and figures. It’s about destroying the morale of other people. It just hints at the idea of listening to ourselves and taking the pulse, which gives us information about the body. “The Woman with the Invisible Necklace” is such a fun and whimsical tune, especially with the handclaps. What’s the story behind it? I don’t know if it’s because our bass player is Spanish and there is some kind of influence there, but I love handclaps personally. Whenever I can put them in, I will. I was experimenting to create something more uplifting. It’s an upbeat song. It’s mysterious where this song comes from. How’d you wind up collaborating with Hot Chip’s Alexis Taylor? Some years ago, we toured briefly with Hot Chip in America. We did maybe five shows. I befriended Alexis and we kept in touch. I always wanted to sing a duet with him. Now, I finally had a song about free love and about a couple interrogating themselves about their feelings toward one another. Basically, I wrote him an email and sent him the song. He accepted. What keeps you going after all these decades? I don’t know. I feel amazed at it. I am approaching 50 years old, so what else would I do? I love doing this and I’m very lucky that I can. There are lots of people who can’t. They have to stop and redirect their lives. I’m extremely fortunate and privileged to still be talking to you from the road today.